They say that the longer a meal takes to prepare, the better it tastes. If this is true, Moroccan food is the best in the world. Moroccan meals take hours to prepare and it's worth it. There are so many flavours and layers to each dish. Eating out in Morocco can be intimidating. Often times when we go to a restaurant, we don't know where to begin and end up ordering a safe and boring dish. To prevent you from being safe and boring like us, we thought we'd round up the best Moroccan food for your next trip to the Middle East. 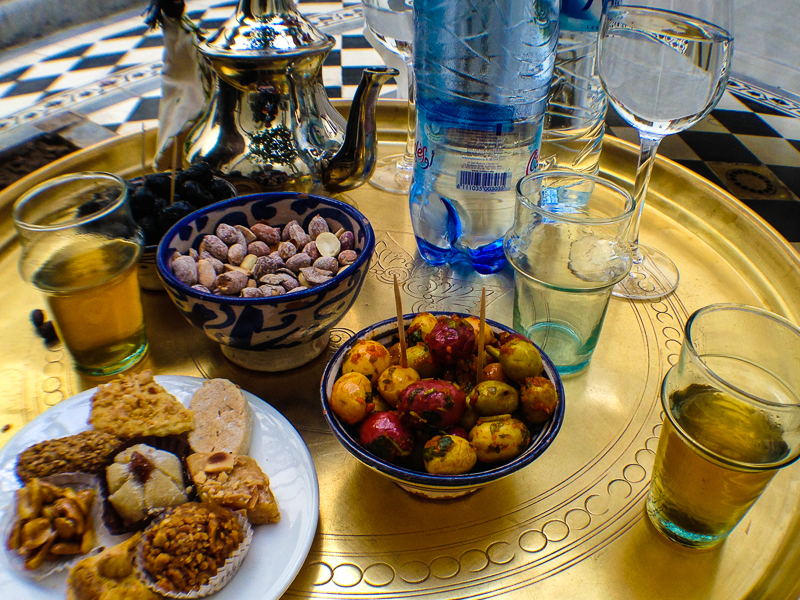 We spent an afternoon preparing and cooking an incredible multi-course meal at Riad El Cadi in Marrakech. When we arrived they had tea and appetizers waiting for us as we smelled the rich aromas in the air. We couldn't wait to get cooking. But not until after our snacks consisting fresh nuts, olives and tea. 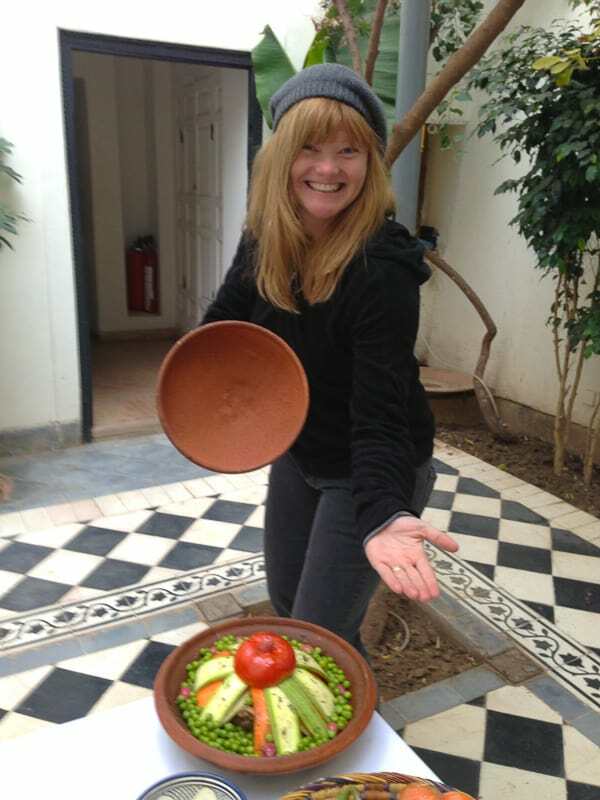 Info: You can book a Moroccan cooking class for $60 USD/pp at Get Your Guide. 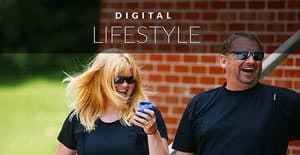 It includes a three-hour cooking demonstration by a gourmet chef, great conversation, appetizers, tea and still/sparkling water throughout the day. The course followed by a candlelight dinner in a fine dining establishment. Oh and don't forget the bottle of wine for two people included. 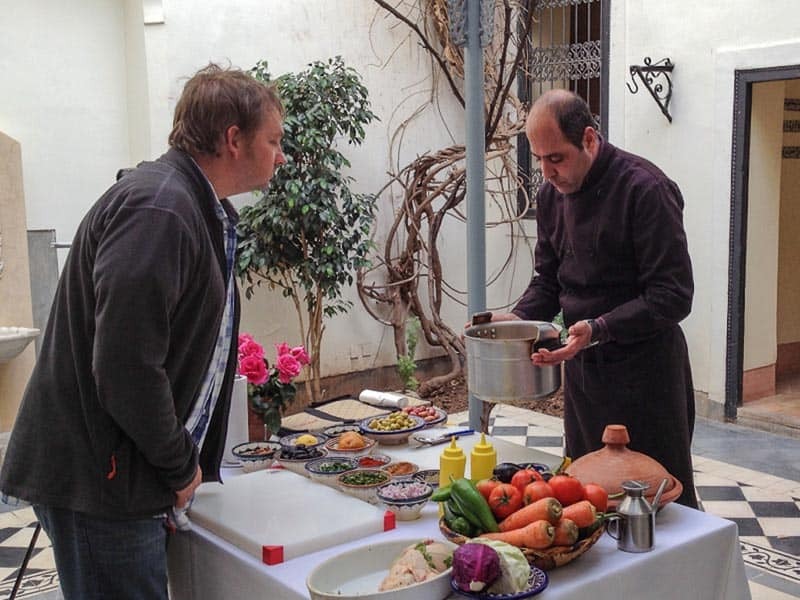 Once we settled in, we got down to business and spent the afternoon learning about and cooking Moroccan Cuisine. We gained a better understanding and new appreciation for this exquisite cuisine and we now have the confidence to order whatever we wished off of future Moroccan restaurant menus. 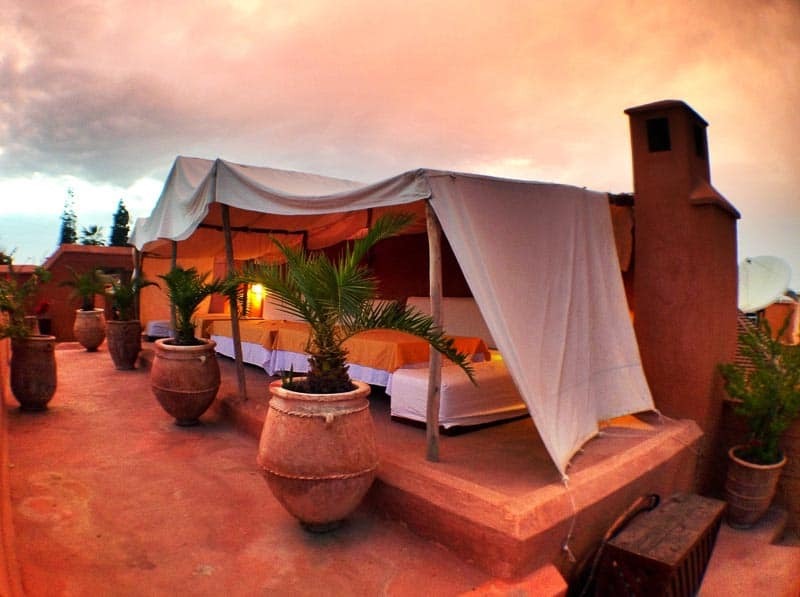 It was one of the best afternoons we had in Marrakech. If you go, make sure you book a cooking class of your own. 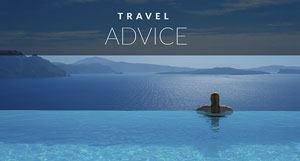 Some of the cheapest eats are on the streets, so be sure to go to the market or enjoy a kebab at a street-side stall. My recommendation is to look for a spot filled with locals and join in. Expert Tip: When eating Moroccan Cuisine, be sure to use your right hand. Often times you'll be scooping up dips, stews, and salads with fresh bread. To help you decide what dishes to start with when you do sit down at a restaurant, here are some must-try Moroccan food dishes to get you started. Deb shows off her dish! Tagine is probably the most popular entrée you'll order in Morocco and it is magnificent. Tagine can either be chicken or lamb and it is a dish slow cooked in a clay pot with a myriad of vegetables, spices, and meats. The flavours infuse during cooking and everything comes out tender and delicious. When we prepared our Moroccan meal, our feast started with many salads. If you are a vegetarian, you are going to love Moroccan food. We had so many different salads ranging from cabbage, carrots and even lemon and oranges to our favourite salad, eggplant (aubergine) zalouk. 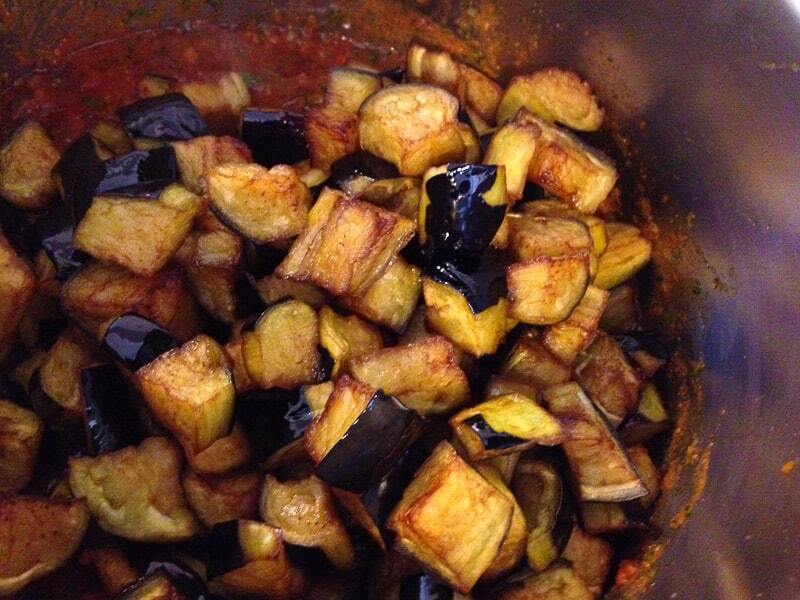 The eggplant is slow cooked and then puréed into a flavourful dip with garlic, spices and tomatoes. Couscous is the staple side dish in Morocco similar to rice or quinoa. However, Moroccans mix flavours in their couscous including raisins, spices and vegetables. 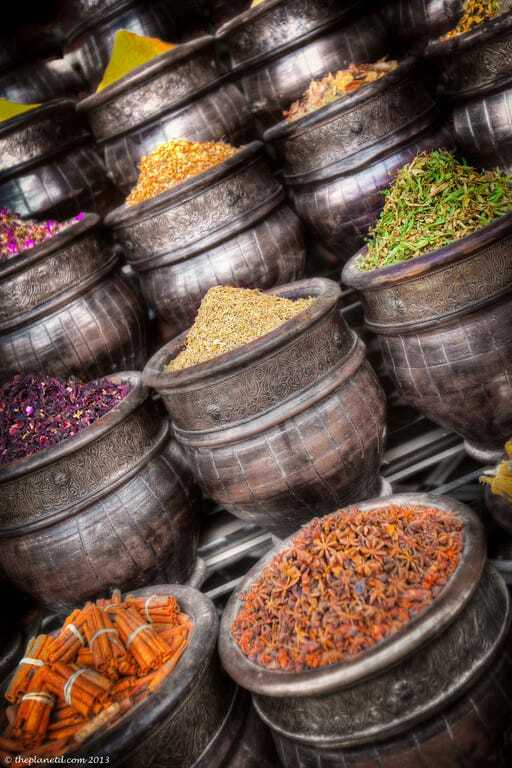 Remember, Morocco was a part of the spice route, so when you visit the country, be prepared for meals filled with flavours like you have never had before. Moroccan cuisine must be the healthiest in the world. It's filled with endless vegetables, spices, and legumes. I love eating the array of stews with fresh bread. For the vegetarians out there, chickpeas are an excellent source of protein. Slow cooked with tomatoes and potatoes, this is the perfect dish served over couscous. So it may not be Moroccan food, it is a staple in Moroccan cuisine. The mint tea of Morocco is fresh and filled with leaves. 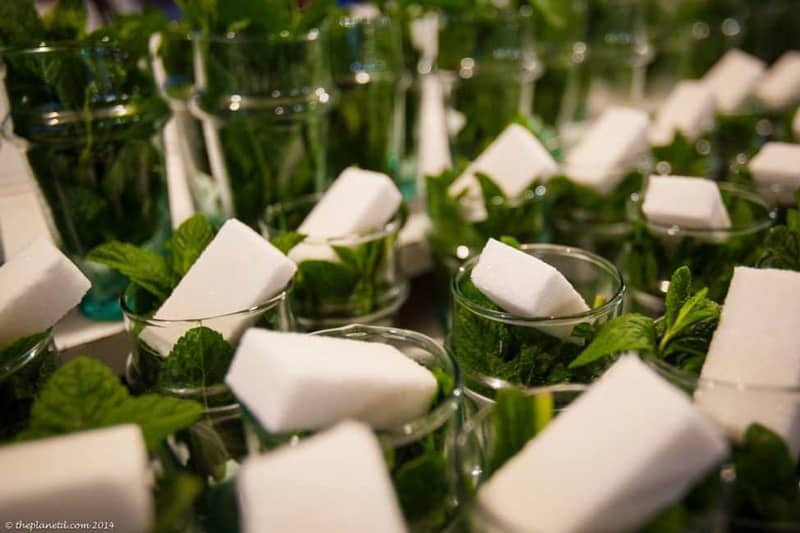 We had the best mint tea at the main market of Marrakech (Djemaa el-Fna) where they put blocks of sugar cubes on top of min leaves. Once you order a cup, they pour hot water over the ingredients melding them all together. Harira Soup is a popular starter dish in Morocco, but it is often eaten at lunch on its own as it has everything you need for a well-balanced meal. This tomato-based soup is filled with chickpeas, lentils, vegetables and meat. Add some bread to that dish and you have yourself a hearty and filling meal. 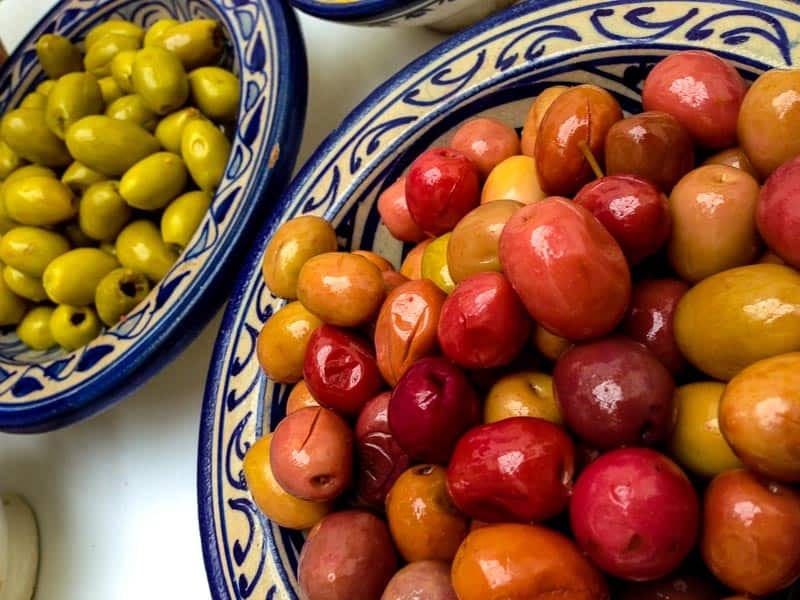 You'll be able to order starters of olives at any eatery and often nuts are on the menu or easily picked up at supermarkets. Olives are usually tossed with spicy ketchup or preserved lemons. But the way we like them is with nothing at all. Make sure to indulge in pistachios when in Morocco, they are so expensive everywhere else in the world. It's a treat to be able to munch on them at will. If you are looking for a quick eat, stop at a streetside stall to enjoy a kebab. These skewers of chicken, beef, or lamb are spiced to perfection. They're quick, cheap and delicious. It's Moroccan fast food and a kebab will tie you over between meals. Baba ghanoush has always been one of our favourite dishes, even before visiting Morocco. This eggplant based dip is mixed with onions, tomatoes and various Moroccan spices. It's a delicious starter served with bread for dipping. Briwat Rolls are layered filo pastries stuffed with sweet or savoury ingredients. They can be served as appetizers or deserts depending on what you put in them. These bite-sized snacks come in different shapes like triangles, long spring rolls or squares. Speaking of desserts, make sure you try Moroccan dessert, there are plenty of delectable snacks to be had and they know how to enjoy a good sweet. We learned all about how to cook Morrocan food at Riyad El Cadi during our cooking course on a sunny and warm afternoon. As we entered the courtyard, we were greeted with mint tea and big smiles. We then sat at a table filled with pistachios, olives and pastries placed beside another table filled with all the ingredients we needed for today's cooking class. No need to rush and get to work here, it was time to sit back, relax and have a cup of tea. 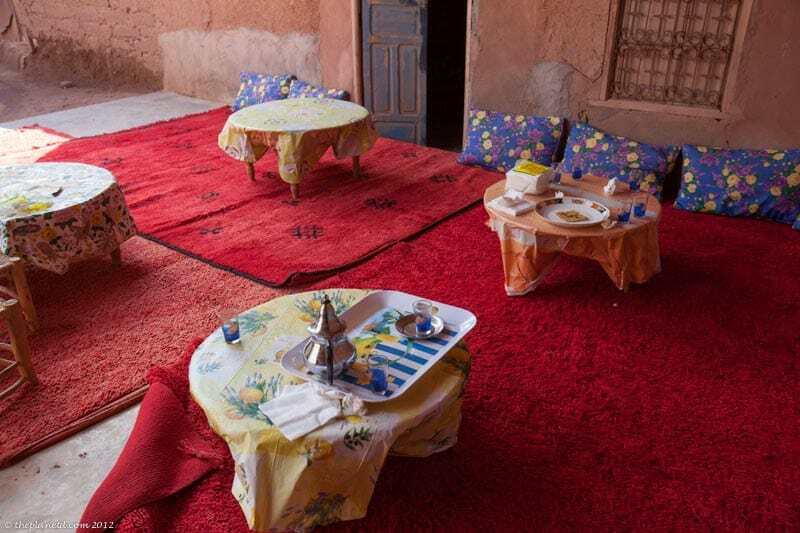 A Riyad is a traditional Moroccan house with an interior courtyard. 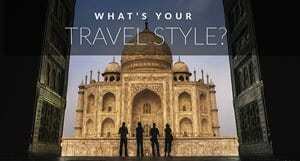 Some are larger than others depending on the wealth of the families who owned them and today most are transformed into guesthouses and hotels. The Riyad El Cadi is one of the largest in Marrakech and clearly was owned by someone very rich. You can get lost walking through the back hallways and corridors of the place. 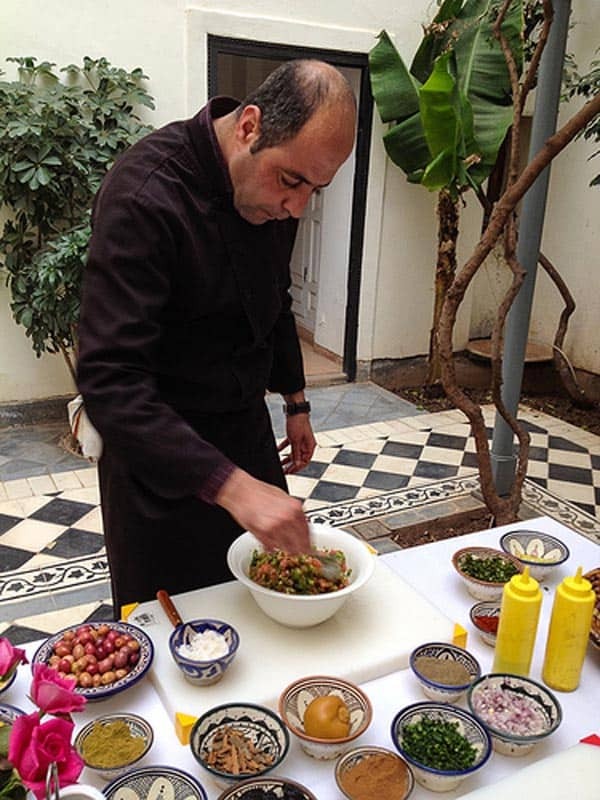 As we munched on the most delicious olives on earth, Chef Hassan came out to prepare the days menu for us. They showed an array of spices and vegetables that we'd be putting into our dishes and we couldn't wait to get started. When you go out for dinner in Marrakech or other Moroccan cities, expect to pay a little more than you will in other Middle Eastern countries, but there is a reason for this. Moroccan cuisine takes a very long time to prepare. We had read this in our Lonely Planet Marrakech guide, but until we saw first hand just how much preparation goes into Moroccan food, we didn't believe it. Our cooking class ended up being more of a demonstration than a hands-on cooking lesson, but that was fine by us. 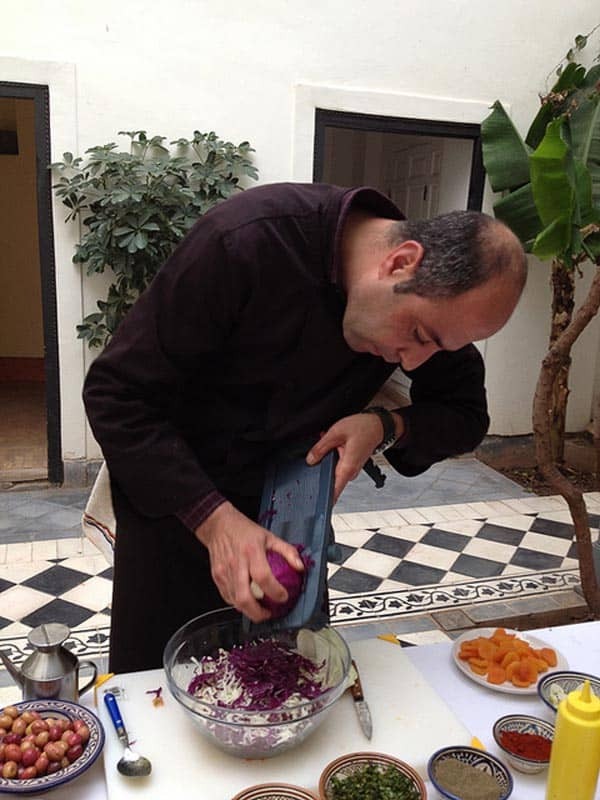 We got to chop a few vegetables and plate a bit of food, but for the most part, Chef Hassan did all the work. As we worked his magic, we realized that we could never learn how to cook Chicken Tagine or Moroccan sauces in one short day. So instead of fretting about not being able to help out, we sat back, sipped our tea and watched the show. 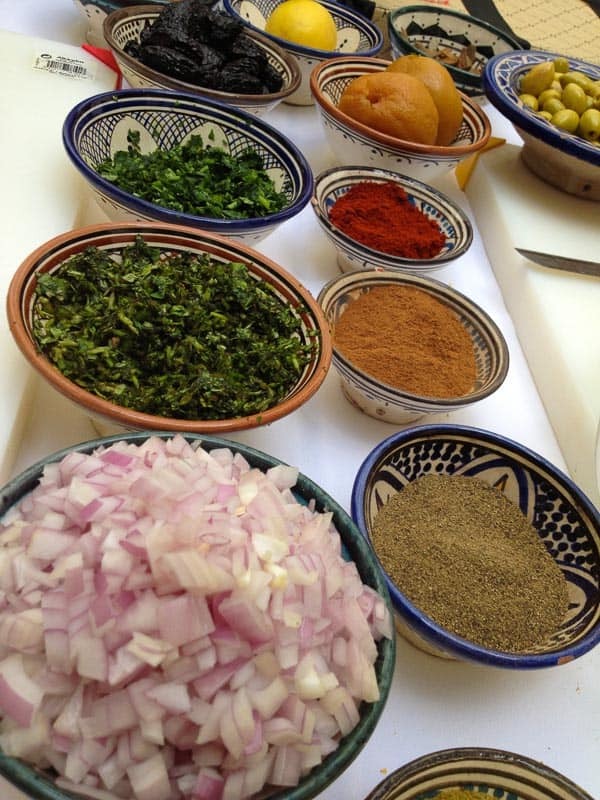 Let me tell you a little bit about Moroccan Food preparations. When I asked Ali how long the chef works each day, he told us that there are two shifts at work. The Sous Chef works all morning preparing, cutting and putting together all the spices and ingredients and then the Chef comes in at 3:00 to start preparing for the evening meals. They only make a limited choice of main meals for the menu each evening as so much work goes into each dish. The patrons of Ryad el Cadi must rely on the expertise of the chef to choose their meal for the evening and believe me, you won't go wrong. 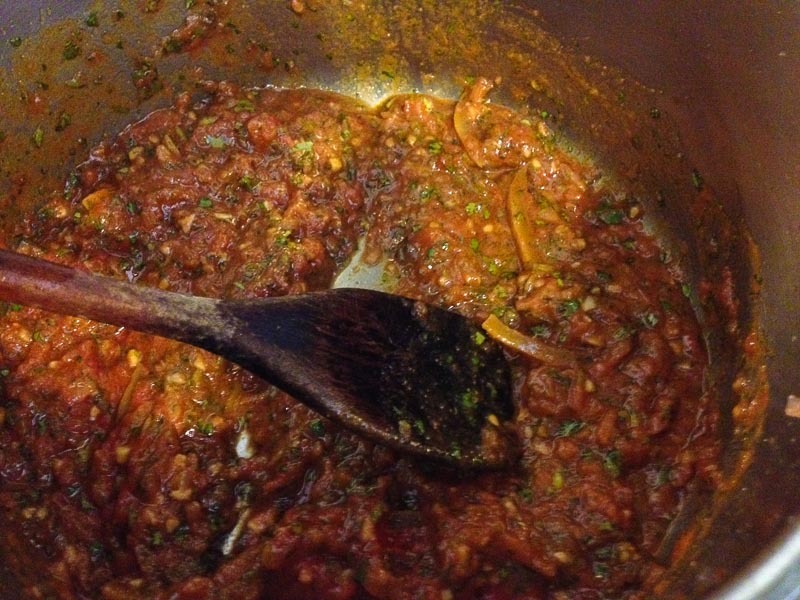 Each dish is carefully prepared by mixing spices like cumin, paprika, nutmeg and coriander together. Vegetables are peeled and chopped and sliced and diced. 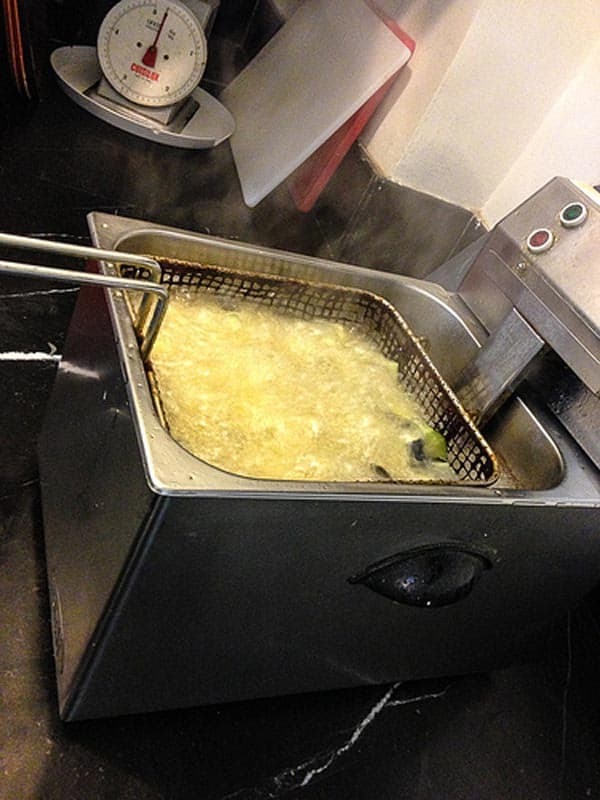 Some are fried in a deep fryer while others are placed over a flame to roast off the peel gradually. Tomatoes are boiled and placed in plastic bags then peeled by hand and carrots are placed in pans and cooked over high heat. Our main course consisted of Berber chicken Tagine with Vegetables and Beef Tagine with prunes and almonds. These are cooked slowly in a tagine pot which lets all the spices and flavours infuse in the vegetables and meats. Deb Shows off the pot! Moroccan Cuisine is some of the best in the world. If you get the chance, try to eat at a local's house. I said it earlier, Moroccans are very friendly, so don't be surprised if you are invited home for dinner by a friendly local. 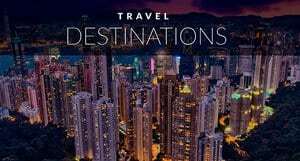 If you don't feel comfortable eating with strangers, there are many tours that offer home-cooked meals as a part of their itineraries. 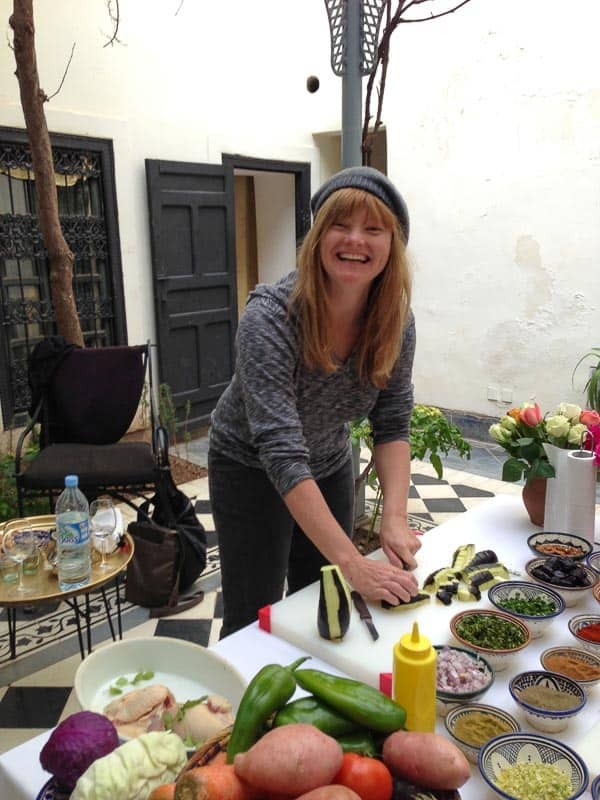 I suggest booking a food tour or a cooking course like the one we did at Riyad El Cadi. 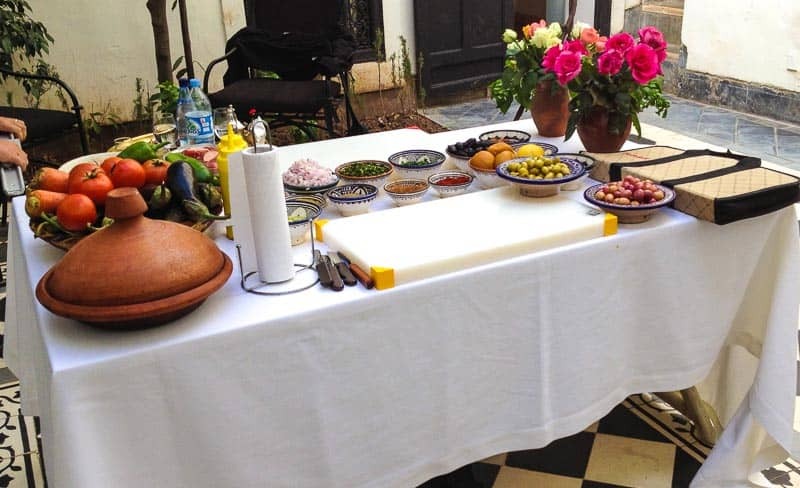 Info: If you want to experience your own Moroccan cooking class Get Your Guide offers an afternoon for $60 USD Per Person. It includes a three hour cooking demonstration by a gourmet chef, great conversation, appetizers, tea and still/sparkling water throughout the day.The course followed by a candlelight dinner in a fine dining establishment. Oh a bottle of wine for two people included. 13 Responses to "Moroccan Food – 11 Must Try Dishes"
Every dish looks really super delicious, it reminds me of mom’s dishes! I am moroccan and lately been trying all my mother’s recipes to try and enjoy my childhood dishes, and it seems I’m doing well!! 🙂 so I started a blog lately about it, let’s see how it goes. 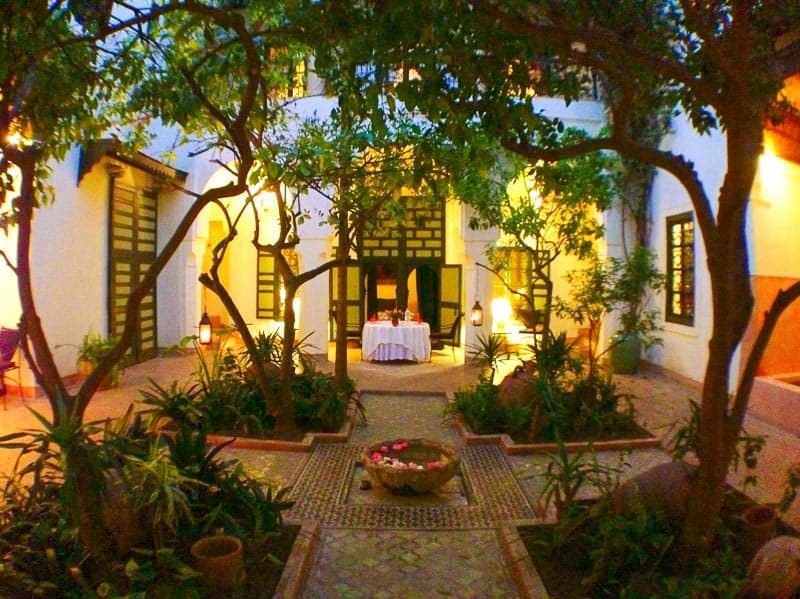 The next time you visit Marrakech try a special dish of this city: the Tanjia. It consists mainly of meat cooked in a terracotta container. The dish is cooked for hours in the ashes of the fire. Looks sumptuous! I’ve always thought of taking some cooking lessons in some places and have always forgotten to actually do it. This is so on my list of To Do’s, especially now that we are so close in Spain. The cooking class is a wonderful idea! Your pictures make me want to dive in and eat. I can’t wait until we schedule a trip there. 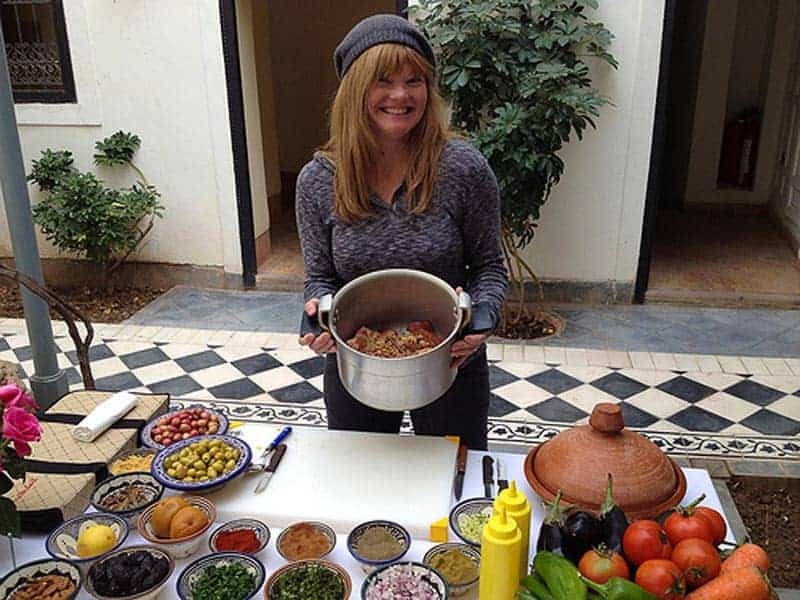 Oh Deb, you look really happy in these photos 😀 What better way to enjoy a Moroccan meal than going to Morocco itself, right? Food looks so delicious, and Riyad seems like a beautiful place. Oh my gosh, you went to a Moroccan cooking school!!! I loved Morocco and unexpectedly loved the food too – I’ve always found Middle Eastern food a little bland sometimes but Morocco blew me away with its Lamb Tagines! Your cooking school experience looks wonderful! And your photos are all so gorgeously sharp! 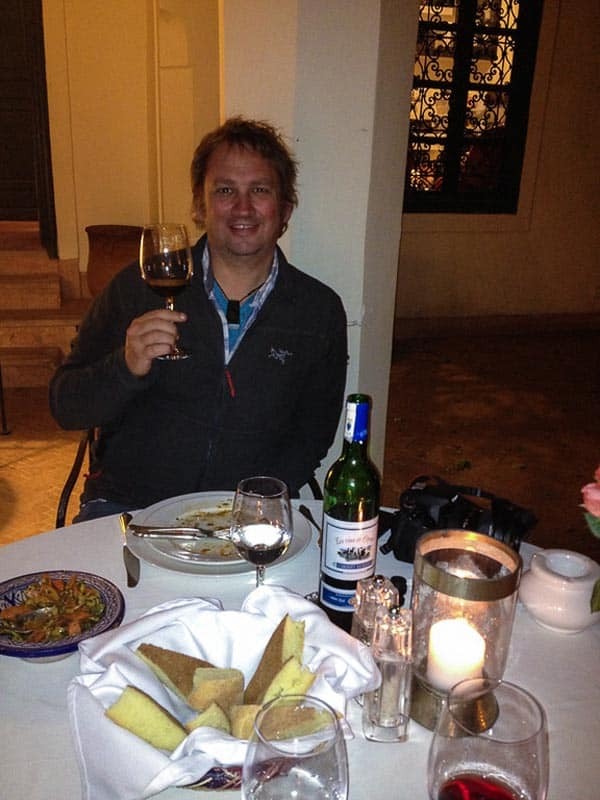 Thanks for letting my relive my fancy Moroccan dining experience! I’ll never forget it but your post has made me remember how much I loved it all over again! 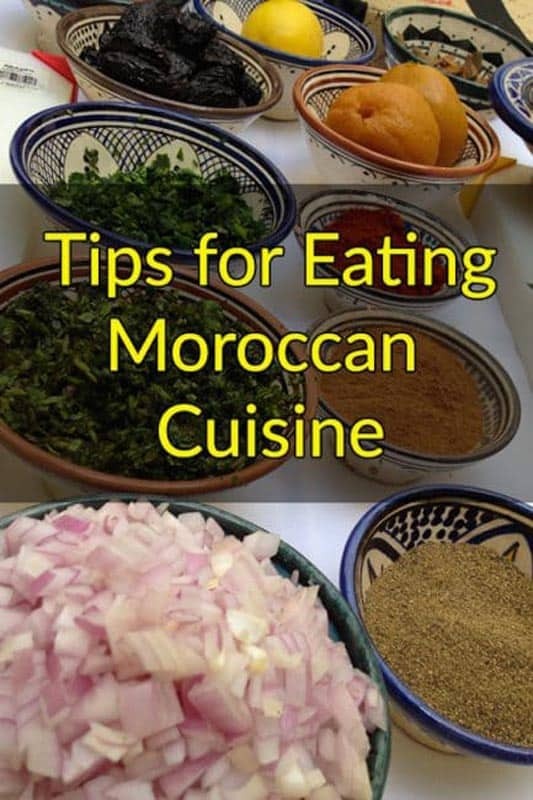 At first it seems really time consuming and difficult to put together a Moroccan meal but I promise there are lots of short cuts that home cooks take that make the meal just as delicious! Plus, once you get the hang of it you’ll be whipping through it in no time!! Great review, loved the full experience you shared! WOW. Just…wow! That all looks so good. 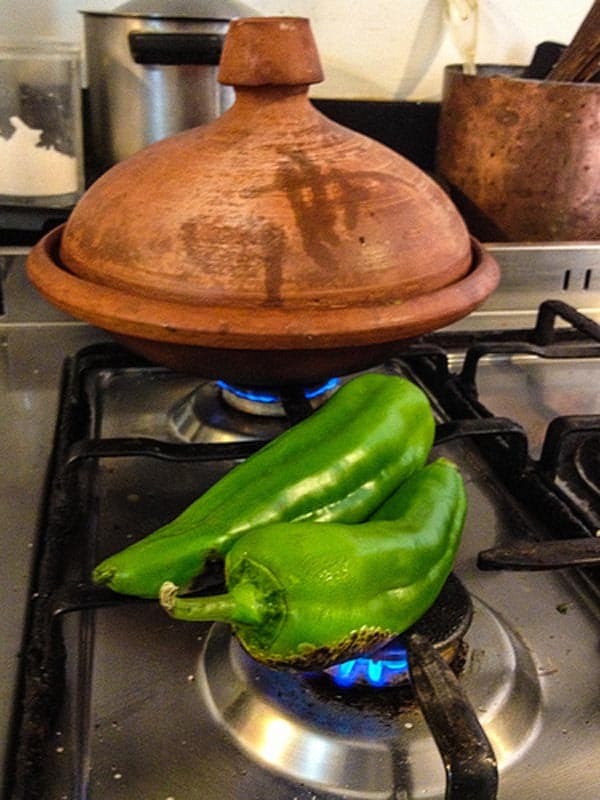 I’ve never been to Morocco, but I love cooking Moroccan food…when I have the time. There really is so much preparation! Cooking lessons sounds fun! especially with a type of food your not use to cooking. I bet it tasted good.